Nanomaterials are material science based approach to nanotechnology. All the materials that are used for nanotechnology are studied and their properties are applied according to their application. Â Most of the nanomaterials used in nanotechnology are smaller than 1 Âµm. All materials in nano scale size have quite a large surface area to volume ratio. This single characteristic paves way for new quantum mechanical effects. Due to these effects the size of the particle reduces, which causes a change in the electronic properties of the solid. When the size of the material becomes micro, there will not be any interference of the quantum effect. But the effect will start its play as soon as the material becomes nano-sized. There will also be changes in the physical as well as catalytic activities of the material. Thus, it is understood that there is a drastic change in properties, when the material changes from macro-scale to nano-scale. These changes can be very unique and can be used for a variety of applications. Let us take a look at the change in characteristics that occur when a material changes its scale from micro to nano. For the manufacture of nano-devices in different sectors, highly pure ceramics, polymers and material composites are required so that they can provide high performance. If not, the packing becomes non-uniform and the irregularity in the shape of nanoparticles causes differences in the packing density. Non-uniformity can also be produced due to agglomeration that is beyond control. Due to this problem, the material may be subjected to porosity and the material may experience a property change from plastic to brittle. Even if the uniformity is maintained during the manufacturing process, the material may be subjected to certain error during the packing time. This causes a change in the density of the material, and is prone to increase during the sintering process. Due to this, it is always advisable to process the nanomaterial in such a manner that with regard to the distribution of components and porosity the material is physically uniform. This would be much better than using particle size distribution. Fullerenes are actually grapheme sheets rolled in the form of spheres and are actually a class of allotropes of carbon. A main example of fullerene is carbon nanotubes. They are known for their mechanical strength and their good electrical conductivity. 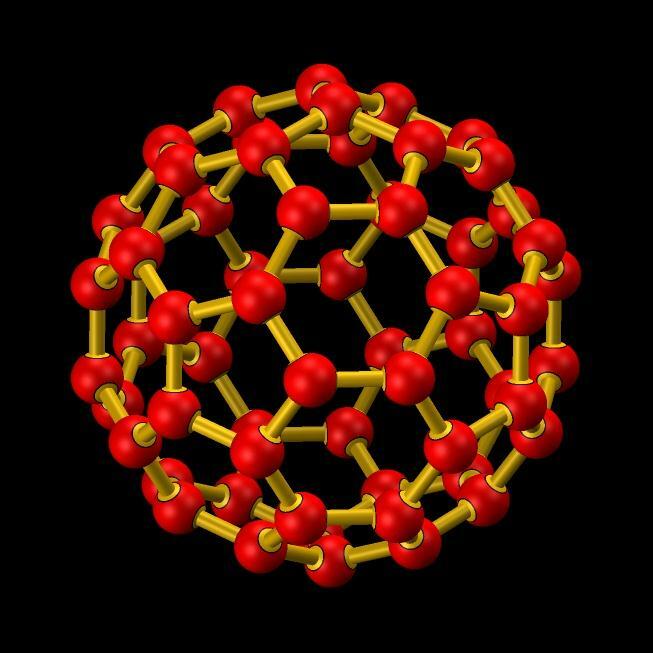 Take a look at the fullerene structure given below. Fullerenes are mainly used in the medical field as they are known for binding certain types of antibiotics to the structure of resistant bacteria. They are also found to be resistant against melanoma, at type of cancer cell. All these are possible only because of the good physical and chemical properties of fullerenes. They are also known for their high resistance and superconductivity properties. Thus, they also find great applications as light-activated antimicrobial agents. Fullerenes are obtained by inserting a large amount of current in between two very close graphite electrodes in an atmosphere that is inert in nature. From the reaction a carbon plasma arc is obtained in between the electrodes, which then forms as a residue. This residue is then converted to obtain fullerenes. Nanoparticles are made from metals, semiconductors, and other particles that have great chemical, physical, electrical and magnetic properties. Nanoparticles find its main application as chemical catalysts. Nanoparticles have a size so small, that they actually lie between the bulk materials and the molecular structures. Â As a result they possess some of the properties of the bulk materials as well as molecular structures. To know the special properties of nanoparticles, let us compare the bending if bulk copper with that of copper nanoparticles. If bulk copper is bent, the movement of copper atoms/clusters is approximated to be at the 50 nm scale. At the same time, copper nanoparticles which have sizes below 60 nanometres will not have the same ductility like bulk copper. Also, when the size decreases, they are known to be very hard. Sol-gels are also considered as nanomaterials for some applications. It finds its main application in some fields like material science and ceramic engineering. The actual process for producing sol-gel is called Chemical Solution Deposition. Such a wet-chemical process is used mainly for the fabrication of metal oxide. Te process starts with a chemical solution, which acts like a precursor. The most common precursors used are metal alkoxides and metal chlorides. These precursors undergo severe reactions to produce a network called “elastic solid”. Such an elastic solid will be a complex system which includes amorphous submicrometer particles dispersed to various degrees in a host fluid. The main characteristics of nanomaterials like size and shape were observed during the early 1900â€™s. The main study was done by Zsigmondy, who made detailed studies of nanomaterials that were lesser than 10 nanometers in size. As most of these particles are much smaller than the wavelength of light, an ultramicroscope was used for seeing them. Different types of techniques are employed to characterize the nanoparticles. The most different assessment is in finding the size characteristics. Most of the nanoparticles that are expected to be in the nanometre range actually aggregated in solutions. Even light scattering method, ultrasound attenuation spectroscopy, and so on are used to determine the size and also for knowing the concentrated nano-dispersions. Other characteristics of nanoparticles like surface charge and zeta potential is also found out using certain methods. All these characteristics have to be found out so as to determine the stabilizing point of the material, aggregation prevention point and so on. Some of the common methods that are used to find the characteristics are colloid vibration current method , microelectrophoresis, electrophoretic light scattering and so on. One of the main reasons for developing nanomaterials is to save the health of people by the advanced treatment methods the material can provide. The material is good enough in providing advanced targeted methods in delivering drugs. They are also advantageous in detecting diseases in the early stage of its formation. They can also be used for cancer therapy. But apart from all these advantages, they are also known to produce side effects. A different type of approach must be made to test and know the effects of nanomaterials on human body and also on the environment. As the behaviour of nanomaterials is very different from any other small-sized particle The OECD Chemicals Committee has formed a Working Party on Manufactured Nanomaterials who are to study the different effects of the material and bring about the different safety regulations. One of the main effects of nanomaterials is the increased rate of absorption. When the nanomaterials are manufactured, the ratio of their surface area to volume increases, and causes the rate of absorption to go up through the human skin, lungs and even the digestive track. The main point is that the particles must be absorbed in very small quantities so as to avoid health hazard. The safety regulations do not only concern the people who are applied with, but also the workers who provide it. In order to provide safety, the Swedish Karolinska Institute, conducted different experiments by adding different nanoparticles like iron oxide, zinc oxide, copper oxide and titanium dioxide into human lung epithelial cells. Out of these iron oxide nanoparticles were found to produce a little DNA damage and were non-toxic. Zinc oxide was known to be more toxic and copper oxide is known to be the most toxic material.